Me and Sophie arrived in Luxembourg on sunday afternoon. 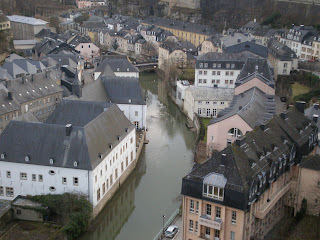 I've wanted to travel to Luxembourg ever since I went to primary school. I remember I even gave a small talk about this country during a class in geography. I think the size of this country is what fascinates me the most. Why is it even a country of it's own? This picture is taken from one of the ancient walls surrounding the city. The differences in altitudes in Luxembourg were huge so we had to walk a lot up and down, escpecially when the city centre was in the upper town and our hostel in the lower town :) But it also felt very good to walk again in stead of always taking the metro everywhere! Some fresh air is only good for you! The city was also much greener than Trier and I think it would look lovely in the summer! February isn't perhaps the best time to travel in this part of Europe. Everything is grey and dull and it's mostly raning all the time. I hope I someday get a chance to have a road trip in Europe during a summer. 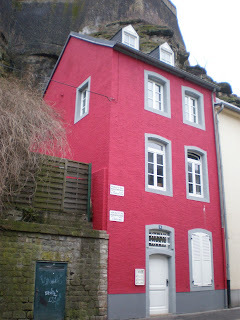 Then I'll definately visit Luxembourg (and Trier too!) again! Even here we visited a museum of history and art. It made us realise how much behind Finland is when it comes to history. I mean, there were loads of findings ever since the stone age! You should have seen the different collections! They were incredible! For example the prehistoric section about the Gauls! When I compared that to the medieval exhibition at the Espoo City Museum, I just couldn't help laughing. They are like from two totally different worlds... or even planets! Unfortunatley photos weren't allowed in the museum. 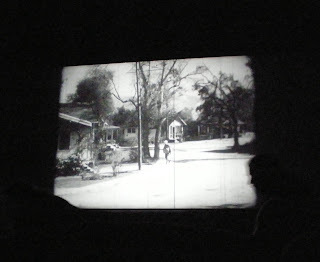 The funniest thing is that I actually thought the movie was scary :D The shadows were much deeper since the picture was already in black and white and I jumped every time something sudden happened. After this I'm even more convinced that I'll never going to watch a real horror film... That's just not for me.